I've been searching for the perfect lantern for our entry forever! They are either too small, too big, the wrong shape or outrageously expensive. This one, as seen in Traditional Home is probably outrageously expensive since it's an antique. But still, it is what I've been looking for. I fell in love with this gorgeous wooden lantern from Horchow, but it is way to big. However, I did order the smaller version but it came with just one socket for a 60 watt bulb. Perhaps it could have been retrofitted with a candelabra, but I don't have the patience. This simple square lantern from Pottery Barn has been calling my name. It is not too big, not too small, a perfect simple shape. Here they show it in an entry, similar to mine. 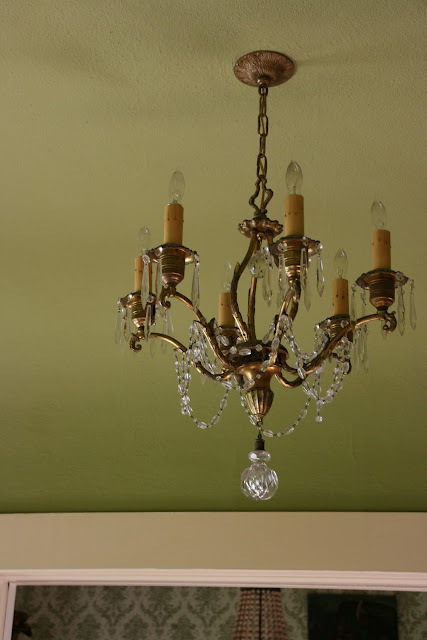 It replaced the ornate crystal chandelier that has been here for 13 years. Don't get me wrong, I still love this chandelier, but want a simpler look. 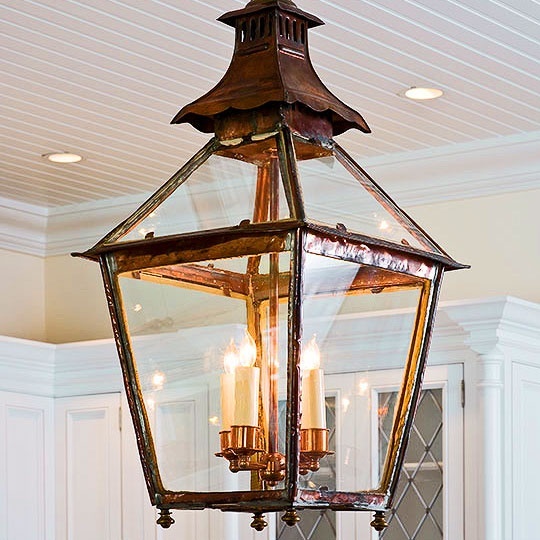 The new lantern in the entry coordinates better with the chandelier in the dining room. It's not the perfect lantern, but it gets the job done! I love the entry with its new updated look. And since the living room is also getting an updated look with grasscloth walls and fresh upholstery, it will be a nice transition. I love lanterns too~ yours is so charming!! Can't wait to see more of your re-do!! Love it! It marrys well with the dining room chandelier! Great choice. I was going to say go with the Pottern Barn light but never mind, you beat me to it and it looks great. Much better than the old. Love the lantern in that spot and I especially LOVE how you hung the oil up high in the entry. It looks wonderful ~ I just have to tell you once again how much I love your green entry. It makes me smile each time I see it. Delores I love your entry and the new lantern looks wonderful in there!! Love the new look. Funny how a simple light changes everything. It looks wonderful, Delores ... perfect for your gorgeous entry! 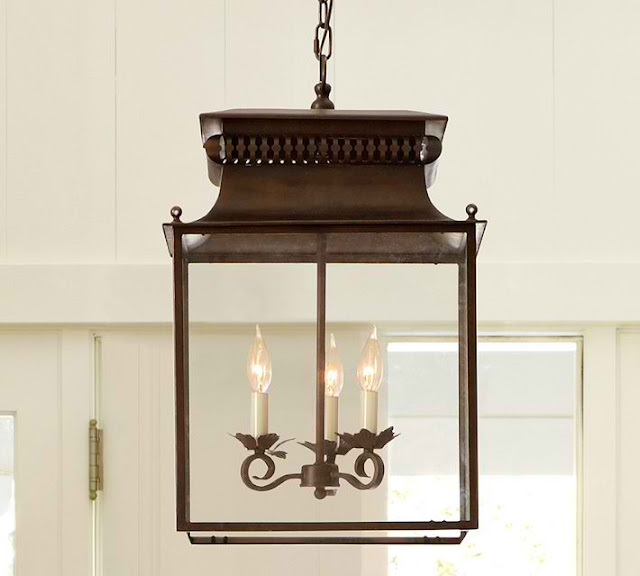 I've been eyeing that very same lantern for quite awhile ... one might just end up in my home, too! Love the new look! I'm wanting to do some very similar changes myself! Simple sounds wonderful since we are officially empty nesters as of yesterday! I love lanterns of any kind truthfully…we need some in for the shop for sure! Have a great week! Delores I adore your new lantern it looks just perfect to me!! Looks great! More of an updated look. Can't wait to see your living room update when it's done. I love lanterns...they are making a statement indoors..love that! 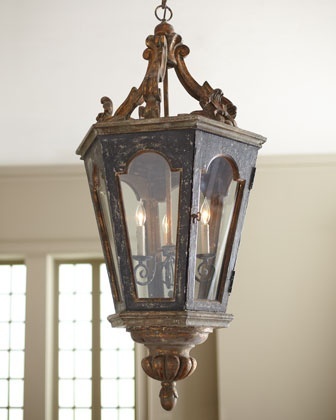 The PB lantern looks perfect in your foyer and works well with the one in the dining room. It is so much fun to freshen things up, isn't it? Have a great day, Delores. Your home is my dream place....I can wile away hours just looking at pictures!! Could not be better! Love it! 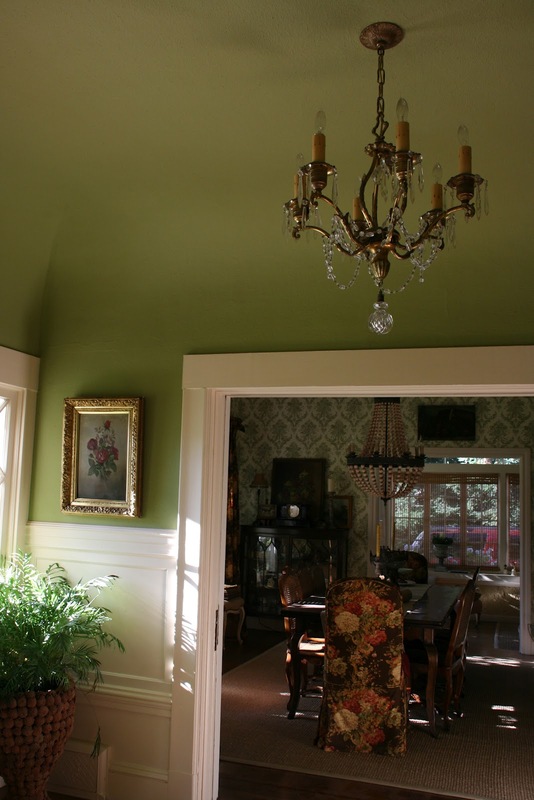 The lantern looks perfect in your gorgeous home, Delores. I look forward to the BIG reveal of your living room....love the grasscloth.